The present study investigates some factors affecting college students’ tendency to use Facebook for different educational purposes. We reached 120 participants who were college students. Our sample comprised of 63 (52.5%) females and 57 (47.5%) males. We applied convenience sampling technique and an online questionnaire to collect data. Descriptive statistics, multiple regression analysis, and Structural Equation Modelling using IBM SPSS AMOS were utilized. The findings provide that GPA, Personal Use of Facebook for Studying and Socialization, Autonomy Psychological Need, and Academic Procrastination foresee college students’ willingness to use Facebook in their courses. GPA and Personal Use of Facebook for studying are the most influential factors while Autonomy Psychological Need is the least impactful. We also examined the impact of these factors on different educational use types of Facebook: communication, collaboration, resources and material sharing. The results are discussed, and further recommendations for future research and implications are presented in the current study. Today one cannot think of any individual without a Social Network account. Regardless of gender, age and social-cultural background, with changing purposes almost every individual having Internet access uses a SNS (Social Networking System). This could be due to the fact that its use is indispensable while every other individual around us uses it or just because this generation has already born into the age of technology; as some researchers call this new generation of learners Homo Zappiens who has the necessary skills to use these technologies on their own without any instruction (Veen & Vrakking, 2006) and as digital natives, who has an inborn technological competence (Prensky, 2001). Besides being a daily, ordinary need of new generation members just like food and shelter, a research study justifies the need of this technology with the fact that some individuals particularly need it to keep tabs on their social network and maintain contacts (Wilson, Gosling, & Graham, 2012). Toma and Hancock (2013) also point out ego needs as a compelling account and state that individuals are in need of seeing themselves as valuable, worthy, and good and that ego plays a role as explained by self-affirmation theory. These individuals could nurture their ego need through the use of SNSs. However, to Valenzuela, Park, and Kee (2009), the amount of Facebook use, for instance, was associated with individuals’ involvement, their life satisfaction, and social trust. When it comes to the features of SNSs, they are stated to offer its users the following opportunities; construction of a public or semi-public profile; a list of other users in connection; an opportunity to view and track people’s connections with others in their network (Boyd & Ellison, 2007). Besides these, Facebook for instance, has started to be used for an educational purpose lately (Nadkarni & Hofmann, 2012). Facebook has been reported to become probably a valued resource to support students’ classroom work and their educational communications and collaborations with faculty (Roblyer, McDaniel, Webb, Herman, & Witty, 2010) although frequent use of it is stated to interrupt students’ studying (Thompson, 2017). To McCarthy (2010) through the use of social media for an educational purpose, students could be drawn into a university culture fostering social and academic interaction among peers. Although e-mail connection is still the mostly preferred communication tool between students and instructors (Roblyer et al., 2010), SNSs enable more effective use of Information and Communication Technologies (ICTs) for the purpose of education. Instructors could use SNSs for various educational purposes such as; (a) to blog; (b) to involve students in numerous academic subjects, e.g. science and literature (O'Hanlon, 2007); (c) to take part in an online cooperative work with other schools (National School Boards Association, 2007, p. 5); (d) to increase the overall quality of engagement for the aim of building up a more effective learning environment; (e) to log both student and instructor interaction (Roblyer et al., 2010); (f) to carry out formative evaluation in the learning process and to design instructive activities consequently (Pasek & Hargittai, 2009); (g) to provide students with a different pedagogy of teaching in the students’ best interest (Hew, 2011); (h) to foster students’ active participation in the learning process and make them feel it (Schwartz, 2009); (i) to mentor students (Schwartz, 2009); (j) to benefit from all information coming from formal/nonformal/informal sources and their synergy (Bosch, 2009); (k) to support collaborative learning and critical thinking and to enhance communication (Ajjan & Hartshorne, 2008); and (l) to access constructive educational outcomes in various fields (Pempek, 2009). Moreover, students who are using SNSs often and actively have a positive perception to use them for educational purposes; the intensity of SNSs usage is associated significantly with the positive perception of the educational use as well (Ean & Lee, 2016; Lim & Richardson, 2016). On the other hand, Sobaih, Moustafa, Ghandforoush, and Khan (2016) indicated that even though educators stated that social media has a great potential as teaching and learning tool, the actual use of social media in education was found at minimal level. Similarly, students are suggested to use SNSs for an educational purpose; (a) to find answers to their questions regarding course venues and assignments; (b) to share information or ideas about projects, study or lecture notes; (c) to inform lecturers about the topics they would choose to learn about; in a way helping a lecturer to come to class more prepared (Bosch, 2009); (d) to communicate or to inform other students; (e) to ask the questions that they hesitate to ask in classroom to their instructors (e.g., due to shyness) (Bosch, 2009; Hew, 2011; Selwyn, 2009); (f) to develop encouraging relationships among students, peers and incorporate learner incentive and commitment (Kabilan, Ahmad, & Abidin, 2010; West, Finch, & Curran, 1995); (g) to participate in learning tasks (Madge, Meek, Wellens, & Hooley, 2009); (h) to develop a positive attitude towards learning and improve its quality (Kirschner & Karpinski, 2010; Pasek & Hargittai, 2009); (i) to enhance relational intelligence, as well as critical thought (Lampe et al., 2008) (j) to increase individual responsibility and autonomy (Grosseck, Bran, & Tiru, 2011; Joinson, 2008); (k) to create their own learning path – students choose which instruments, sources of information, links and connections they will use (Hew, 2011); and (l) to keep alumni and students connected (Halligan, 2010). There are a few studies indicating the results of using SNSs for an educational purpose in the literature. Heiberger and Harper (2008) found that there was a positive association between SNS use and college student engagement. Similarly, Haverback (2009) found that students were motivated to be involved in discussions in Facebook. In their study, Maguth, Yamaguchi, and Elliott (2010) reported that students who use SNSs to access and analyze information, communicate, and showcase their learning were successful in the production and presentation of research results. Barrot (2016) found that Facebook-based e-portfolio had a positive effect on students’ writing practices by enabling e-portfolio assessment more feasible. Moreover, she reported students’ increased energy, well-being and potential to take action, increased knowledge of oneself and others, and, finally, their interest in more connection as the secondary positive consequences of Facebook-based e-portfolio use. Schwartz (2009) indicated the ‘mentoring theory’ as a theoretical basis for the educational use of SNSs. She pointed out SNS exchanges as an effective way of highly-interactive instructional communication and also an opportunity for pedagogical mentoring. It was reported in a study that students appreciated a teacher’s self-disclosure of Facebook (sharing personal pictures, messages, and their opinions); which ended up with more student participation and effective learning (Mazer, Murphy, & Simonds, 2007); and with more teacher credibility for students (Mazer, Murphy, & Simonds, 2009). Regardless of the limited and tentative evidence, as their study revealed, Roblyer et al. (2010) claimed that students seemed much more open to the idea of using Facebook for an educational purpose than the faculty. They stated reluctance of the faculty as the cause for the rejection of this technological innovation. Whereas, the results of another survey by Hewitt and Forte (2006) indicated that, students did not favor appearance of faculty on Facebook, which should actually suit to students more as a social site. There are also other researchers uttered their hesitations regarding use of technology for education especially in learning environments where students learn through observation, repetition and social interaction. They claimed that it ends up with incidental learning in education which causes unplanned or unintentional learning. The reason for this concern was due to the fact that unintended learning may negatively influence students (Herrmann, Fox, & Boyd, 2000; Kabilan et al., 2010). Supporting this, (Alt, 2017) indicated the distractive impact of using social networks during classes due to fear of missing out. Moreover, with his large sample study (N = 2368), Junco (2012a, 2012b) found that frequency of engaging in Facebook chat was negatively associated with the time spent getting prepared for class and that chatting on the net may detract students from schoolwork. To another researcher this detraction may also cause academic procrastination (Şahin, 2014). Similarly, rate of playing games, checking up on friends, and uploading photos negatively affected the time spent in co-curricular activities; whereas, remarking on a content, creating or RSVP’ing (Requesting response to an invitation) to events, and viewing photos were positive predictors. This finding indicates that types of activities on Facebook may create a difference in the way how students spend time on instructional activities. This may occur due to the limited knowledge of technology (basic office skills, e-mail, messaging and surfing over the net) students have. To explain, they most probably need a training regarding use of ICT for learning, a purpose to use SNSs and an explanation on how to absorb information through these media (Kirschner & Karpinski, 2010). In their study, Kabilan et al. (2010) suggested that instructors should however, integrate learning objectives and outcomes of the educational activity for the learning experience to be meaningful. Bloch (2008) suggested doing more research on the issue. On the other hand, in their study, Kirschner and Karpinski (2010) pointed that Facebook users who were university students had significantly lower GPAs and fewer studying hours per week compared to non-users. This finding supports the findings of another study investigating users’ attitudes and satisfaction towards Facebook. In the study, the researchers found that communicating on Facebook was often regarded entertaining by students and that they did not take it seriously (Lewis & West, 2009). Similar results were reached at another study which reported that how students perceived the aim of Facebook use was very different from academic work (Madge et al., 2009). In his study, Çoklar (2012) found that although students had positive perceptions regarding Facebook for its capability of distributing information, arousing interest and motivation, and for the provision of interaction; they were not pleased with its problem of control mechanism, excessive informational convergence. Similarly, another study indicated students’ mixed feelings toward the usage of social media in formal learning settings (Hung & Yuen, 2010); and another one suggested use of SNS as an online environment enabling English language learning (Kabilan et al., 2010). In his study, Drouin (2011) reported a positive association between text messaging frequency and spelling and reading fluency; at the same time, a negative association was reported between “textese” usage on SNSs—such as MySpace and Facebook—and reading accuracy. Wang and Kim (2016) indicated that Facebook supported authentic tasks in second language learning. Moreover, Moghavvemi and Salarzadeh Janatabadi (2017) examined the students’ Facebook use intention in three different measurement occasions and analyzed each model. They found that the perception to use Facebook in education altered along the three models, and students’ increased familiarity triggered the intention to use. They also concluded that Facebook was a complementary tool to deliver course-related links and documents that created an extra time for learning. From the faculty’s side, there were studies indicating that faculty had a tendency to use any technology (such as e-mail) facilitating communication with their students (Roblyer et al., 2010). However, some problems were reported regarding this type of connection (Flynn, 2009; Stansbury, 2009; Young, 2009). As reported in a study, although 77% of faculties were engaged in personal uses of SNSs, only 4% of them used Facebook for an educational purpose which was associated with faculty’s reluctance for this kind of engagement (Moran, Seaman, & Tinti-kane, 2011). Although there were a few initiatives calling for the use of Facebook for educational purpose, more tendency regarding prohibition for classroom uses of such technologies by the faculty members was reported (Roblyer et al., 2010). It is obvious that there is students’ superiority in use of Facebook (Kleiner, Thomas, & Lewis, 2007). Ali (2016) also indicated that medical educators mentioned the criticality of using Facebook as a platform for formal education; however, they remained their concerns related to intruding on the peer nature of online learning community. There are two critical players of educational use of FB: instructors and students. Since this study particularly focused on students’ tendency to use FB in education, we can highlight some factors stemming from the previous works done to date. GPA of students were still cause of concern for both general and educational Facebook use. FB was presented as one of the factors hindering GPA. However, it is also important to observe how students with high GPA reacts to FB in education. Second, students may be inclined to use FB in education since they want to be more autonomous and responsible for their own learning path. Nowadays, these types of needs are widely common and should be investigated as one of the factors for using FB in education. The next negative consequence of general FB use is academic procrastination. In this study, we also wanted to see what students really think of educational use of FB when they have this kind of bad habit. The last potential factor is previous experience of students for using Facebook for personal or general purposes. It is expected that students with extensive FB experience may be influenced while they are using it for an educational purpose. All of these factors were examined in terms of their impact on students’ tendency to use FB for an educational purpose in the present study. There are various types of educational use of Facebook was reported in the literature. These initiatives of educational uses could be grouped under three sub-titles as; for collaboration (to work on an assignment or project); for sharing (to share information and documents including administrative use of Facebook); and for communicating as suggested in their study by Mazman and Usluel (2010). Moreover, Liu, McKelroy, Kang, Harron, and Liu (2016) confirmed these three-educational uses with an additional function, which was providing a space to post informal personal reflections and feelings related to learning quickly. Facebook enables individuals exchange ideas, share information and work collaboratively with the people of shared interests, ideas and needs. Collaborative educational use of Facebook was defined by Mazman and Usluel (2010) with the activities such as working collaboratively within academic groups connected to their educational environment and running team works by sharing homework, projects, ideas, and etc. It is assumed that students may gather in communities on Facebook to work collaboratively on projects, group assignments, for the development of a team work. Madge et al. (2009) found that students thought Facebook was used most importantly for social reasons, not for formal scholar work. Students were reported to be particularly interested in making new friends, staying connected with friends and family at home and planning social events. To students’ perceptions, Facebook is quite different from a learning environment. Students believed that FB is used more frequently for social reasons, although there are some informal education practices. However, to Manasijević, Živković, Arsić, and Milošević (2016) students’perceptions on the issue is; collaboration through academic communities is the most important potential values of Facebook in academic activities. More specifically, medical students stated that Facebook enabled them to get involved in a supportive learning community among their peers (Ali, 2016). In addition to that, Aaen and Dalsgaard (2016) indicated that students’ Facebook groups which were created by students without any involvement of instructors could be identified as a mixture between social life and academic schoolwork. Dalsgaard (2016) also found that Facebook groups had an educational potential for peer-to-peer learning. Collaborative working of individuals, which could be carried out through SNSs like Facebook, is expected to create ‘sense of classroom community’ through which students could feel ‘social connectedness’ defined by Rovai (2001) in the literature. This feeling was stated to be an essential element of online learning (Bangert, 2009) and it may occur in any educational context like Facebook as exemplified in their paper by Blattner and Fiori (2009). Similarly, the results of the study by Cheung, Chiu, and Lee (2011) indicated social presence as an important factor for using Facebook. Students favor being connected with their friends and communicating with them whenever they like. Besides, when users share common interests with their group members, they would like to use Facebook more. The researchers referred the use and gratifications paradigm, social presence and the social influence theories to explain the phenomenon. Finally, Khan, Wohn, and Ellison (2014) and Lambić (2016) indicated that academic collaboration on FB was associated with academic performance, perceived support from actual FB friends, higher-order Internet use skills, and influential support from FB friends. Facebook may be used for educational information sharing. Mazman and Usluel (2010) describes what happens under information sharing for an educational purpose category as sharing of resources, materials, projects and documents. Facebook facilitates the sharing with its facilities of uploading and exchanging videos, audios, visual materials, and links. Students are attracted with the information-sharing facilities of SNSs for learning and the interaction (Hung & Yuen, 2010). The results of the study in which Facebook was used as a learning management system supports this finding. The study reported that students were satisfied with the LMS implementation since information-sharing could be employed in a Facebook group in an easy way through it (Wang, Woo, Quek, Yang, & Liu, 2012). Aydın (2012) indicated communicating as the main reasons for using Facebook. Regarding students’ use, he stated that Facebook encourages communication between students and instructors, and it is a helpful technology for a doctoral student to adapt to a Ph.D. program (Ryan et al., 2011). Educational use of Facebook for communication were listed as the activities enabling communication among students and their instructors, such as class discussions; scholar announcements about classes, courses, resources etc. ; delivery of assignments by teachers. Selwyn (2009) called all these activities under administrative use of Facebook with a different classification and stated that most of the educational use of Facebook was based on the activities like announcing lecture schedules and assignment requirements; which were, however, defined to be far from pedagogical use of Facebook such as inquiring, reflecting, commenting on particular course-related topics or issues. The researcher pointed out that these kind and amount of “mundane, prosaic, and often anti-intellectual” use of Facebook should not be disregarded (Selwyn, 2009, p. 170). Similarly, Grosseck et al. (2011) uttered that the majority of students spent substantial time on Facebook to stay connected with friends and family, to share profiles, photos, etc. but less for academic studies. They emphasized that unless students got clear messages, they would not be pleased to study on instructional activities through Facebook. The results of the study by Skues, Williams, and Wise (2012); may be an explanation for students’ unpleasantness on studying through Facebook. Their study pointed out that there was almost no indication of Facebook’s direct support for any academic activities. Besides, students’ reports in the study demonstrated that Facebook was often accepted as a break or distraction from study. This indicates that just a desire for the educational use of Facebook is inadequate, both faculty and students should be encouraged and informed about using it for this purpose. Regarding the issue, Wang et al. (2012) reported some guidelines to maximize the educational potential of Facebook and similar SNSs. They suggested that educators may use virtual set of tools available in balanced combination with others such as combining virtual with the face-to-face. This study was designed as a correlational study (Creswell, 2012), which allowed the researchers to evaluate the relationships and impacts among independent and dependent variables. What college students think about the use of Facebook for educational purposes? What factors do predict the students’ intention to use FB for educational purposes? How do the factors affect the students’ intention to use FB for different types of educational purposes? The current study utilized convenience sampling. Due to time, money and resource constraints, the majority of educational researchers are not able to utilize random sampling techniques (Wallen & Fraenkel, 2001). We collected data from individuals who were easily accessed at first hand. Due to lack of resources, we had to choose this feasible method. The participants were recruited on the basis of their voluntary participation and they were expected to complete all questionnaires. The generalizability of the results of this study should be considered cautiously. There were total 120 participants (%52.5 female) for the present study. The majority of the participants (90%) use the Internet several times every day. There were 59 participants (49.2%) with less than 250 friends at Facebook; there were 61 (51.8%) participants with more than 250 friends. The average age was 21.46 (SD = 2.60); the average GPA was 2.74 (SD = .54). The participants were using Facebook for average of 5.62 years (SD = 1.97), and using it about 2.47 h (SD = 2.01) daily. Moreover, they used Facebook actively (e.g., for posting, uploading pictures, commenting, etc.) about 4.84 h weekly (SD = 1.79). Table 1 illustrates the participants’ average FB use purposes. They reported (more than 70%) they used Facebook for the purposes under the General Use of Facebook listed on the questionnaire, including 71% for socialization, 71% for studying, and 72% for daily activities. These results revealed that Facebook proliferated in college students’ life for various purposes. Demographic Information: We used this questionnaire to collect certain demographic information related to the participants. There were nine items: (a) student ID, (b) gender, (c) age, (d) GPA, (e) the frequency of the Internet use, (f) how long they have been using Facebook, (g) how many friends they have on Facebook, (h) how many hours they spend on Facebook for only surfing, and (i) how many hours they spend on Facebook actively (e.g., posting, uploading pictures, etc.). Gender was measured on a nominal scale; age, GPA, years of Facebook use, and average daily Facebook use were measured on a ratio scale; frequency of the Internet use, the numbers of Facebook friends, and active hours of Facebook use were used one an interval scale. Facebook Education Use Scale: Mazman (2009) developed this Likert scale in Turkish. There were eleven items and three factors emerged: (1) communication, (2) collaboration, and (3) sharing resources and materials. Expert panel review was utilized to ensure the content validity of the scale. The experts evaluated the instrument for its appropriateness for the measurement goal and clarity of the statements. Cronbach’s α was used for reliability, and the value for the entire scale was .92. The Cronbach’s α was .85 for communication, .88 for collaboration, and .86 for sharing resources and materials. Purposes of Facebook Use Scale: Mazman (2009) developed this Likert type scale in Turkish. There were three factors: (1) social relationships, (2) using for studying, and (3) daily activities and eleven items. The scale was content validated, and seven experts evaluated it for its appropriateness to its measurement goal and the clarity of statements. Reliability was ensured with Cronbach’s α which was .86. For the factors, they were .79 for social relationships, .80 for studying, and .86 for daily activities. Academic Procrastination Scale: Çakıcı (2003) developed this Likert scale in Turkish. It contained 19 items which were under two factors: (1) procrastination and (2) regular studying. The higher score individuals got, the less academic procrastination they usually did. Cronbach’s α was .92. and it was .89 for procrastination and .84 for regular studying. Spearman Brown split-halves reliability was found .87 for the ten-item–half and .85 for nine-item half, and totally .85 for the entire scale. The test-retest reliability coefficients were .89 for the entire scale, .80 for procrastination, and .82 for regular studying. New Psychological Needs Assessment Questionnaire: The Uses and Gratification Theory suggested that different people use new technologies for different purposes based on their psychological and social needs (Katz, 1959). There were some studies demonstrated the relationship between personal FB use and motives such as making new friends or locating old friends, relationship maintenance, holding ties in ethnic groups (Raacke & Bonds-Raacke, 2008; Sheldon, 2008), seeking approval and support of other people (Urista, Dong, & Day, 2009); social investigation, shared identities and content, status updating, social connection, and social network surfing (Joinson, 2008); in addition to relationship related needs, game-playing/entertainment, active forms of photo-related activities, organizing social activities, passive observations (Tosun, 2012). However, we also wanted to reveal needs that may be associated with educational activities. We came across with New Psychological Needs Assessment Questionnaire. The scale was originally developed by Heckert et al. (2000) and adapted to Turkish by Kesici (2008). There were four sub-components of the scale: (1) achievement, (2) affiliation, (3) autonomy, and (4) dominance. These needs seem beyond the personal use of FB motives and can be more applicable to educational settings. The scale was translated into Turkish, and then both language versions were applied to college students at a Foreign Language Education department to ensure the concurrent validity using correlation coefficients. The results indicated that there was a positive and high correlation between two forms (r = .84, p < .01). Internal consistency was examined by Cronbach’s α, and they were found .81 for achievement, .77 for affiliation, .60 for autonomous, and .77 for dominance (Heckert et al., 2000). Kesici (2008) confirmed the factor structure using confirmatory factor analysis, and he found a best fit model for Turkish version. Data was collected by using a questionnaire package prepared by the researchers and uploaded to Google Docs. Potential study participants were sent a Facebook message that included a link to the questionnaire form, which remained active on Google Docs for 7 weeks. A total of 120 students completed the questionnaire. Data was entered into an electronic spreadsheet and then transferred to the software programs SPSS 22.0 and AMOS 22.0 for analysis. Approval for the present study is granted by the Dean’s Office of College of Education and the Head of the Department. All participants voluntarily participated in the study. The first research question was examined using descriptive data analysis (frequency, percent, central tendency measures, e.g. mean, standard deviation, etc.). To answer the second research question, multiple linear regression analysis was applied using the seven variables as independent variables and entire Facebook Educational Use scale scores as the dependent variable in order to measure the degree of impact each independent variable had on the educational use of Facebook. Before proceeding to examine the second research question, the assumptions of the multiple linear regression analysis were explored, and no issues were observed. Finally, structural equation modelling (SEM) analysis was performed using each of sub-components of Facebook Education Use as dependent variables, and the appropriate model fit values were analyzed to examine the third research question. The higher the scores obtained from Facebook Educational Use questionnaire indicate that the more frequent engagement activities of Facebook there are for educational purposes. Overall, participants reported that they would like to engage in more than 77% of educational use of Facebook listed on the questionnaire, including 77% for communication, 80% for collaboration, and 72% for sharing resources and materials purposes. Descriptive statistics related to educational use purposes of Facebook are presented in Table 2. These results revealed that Facebook have been proliferating in college students’ life for not only personal but also for educational purposes. Communication purpose was the most preferred one; whereas, Sharing Resources and Materials was the least. We utilized a stepwise method multiple regression model to examine the influence of independent variables on Facebook Educational Use. We entered all demographics, purposes of personal Facebook use (social relationships, studying & daily activities), academic procrastination scores, and psychological needs (achievement, affiliation, autonomy & dominance) to the analysis. The analysis indicated six variables significantly explaining 46.8% of total variance [F(5, 114) = 20.063, p < .01]. We presented coefficients of the variables remained in the model in Table 3. Note. N = 120. R2 = 46.8. Adjusted R2 = 44.5. Dashes indicate no value. Using Facebook for studying was found to be the most influential factor. When students used Facebook for studying purposes, they were mostly inclined to use it for solely educational purposes. The second highest impactful factor was GPA. The students with higher GPA were more prone to use Facebook for educational purposes. The third one was using Facebook for Socialization. When students were very social on Facebook, they had more opportunity to use Facebook for educational purposes. Autonomy psychological need and academic procrastination were two of triggering factors with close impacts on educational use of Facebook. Students with higher autonomy needs were more prone to use Facebook for educational purposes. Finally, the students delaying their academic work less were more inclined to use Facebook for educational purposes. The relationships between the factors and the three sub-components of educational use of Facebook as specified in hypothesized model (See Fig. 1 showing the possible effects of six different factors on types of Facebook Educational Use) were examined carefully in this section. We examined both univariate and multivariate normality which Arbuckle (2007) stated as a critical assumption before performing the analysis. For variance and covariance based analysis, DeCarlo (1997) indicated that the examination of kurtosis values is more serious than skewness values; hence, kurtosis seriously impacts variance and covariance based tests compared to skewness affecting tests based on means. This led us to concentrate on the kurtosis value since SEM is performed based on covariance matrices. As criteria, West et al. (1995) indicated seven or higher values for critical ratio values of kurtosis demonstrate a sign of univariate data non-normally distributed. Moreover, Byrne (2013) stated that five and higher values of critical ratio for multivariate distribution is an indication of non-normal distribution. Table 4 presenting both univariate and multivariate normality assessment indicates that no kurtosis multivariate critical ratio values exceeding the aforementioned criteria. It could be assumed that the data of the current study was normally distributed. Figure 2 illustrates the standardized estimates of the final model. During the estimation, we removed several paths (Academic Procrastination to Educational Use of Facebook for Collaboration and Personal Use of Facebook for Socialization to Educational Use of Facebook for Resources and Materials Sharing), since they did not contribute to the model fit values effectively. We evaluated and presented fit indices of the model used to estimate the impact of independent variables on some varieties of educational use of Facebook in Table 5. Given that all of the values were pointed out to meet the corresponding fit index criteria identified in the literature except for RMSEA within the acceptable range; however, the rest of the indices were close to good fit. Therefore, the model could be considered effective for describing the study sample. Table 6 illustrates estimates, standard errors, and standardized estimates of the paths. Except for GPA to Collaboration and Academic Procrastination to Sharing Resources and Materials, we found the rest of the paths significant. We found Facebook Use for Studying and Autonomy needs were the main critical factors for Educational Use of Facebook for all components. Facebook Use for Socialization influenced Communication and Collaboration purposes. Academic procrastination played an important role on Communication and Sharing Resources and Materials purposes. When we analyzed the percent of students thinking that Facebook is beneficial for educational purposes in the current study, we obtained a consistent result with the study of Roblyer et al. (2010). Students were willing to engage with Facebook for their educational activities as indicated by Heiberger and Harper (2008). Haverback (2004) found in his study that students were very motivated to engage in discussions, and that they comprehended theoretical principles through effective reading. In particular to our study, majority of students thought that Facebook is a good tool for communication and collaboration Many online discussion environments are stated to support communication and collaboration in the literature (Clark, 2001; Hrastinski, 2008; Murphy, 2004; Rovai, 2007; Yeh, 2010). The underlying reason for students’ high level of motivation to use Facebook for education may be stemming from both their previous gratified experiences with general use of FB and their beliefs about the replication of these experiences in educational uses. The results of the study suggested that students’ current GPA was the main factor affecting educational use of Facebook since it impacted both communication and material sharing and resources purposes. This means that students with a high GPA are not willing to use Facebook for collaboration but for communication and sharing which contradicts with the research results found by Khan et al. (2014). There may be two primary reasons for this finding. First, high GPA students are usually more responsible individuals related to academic works (Tross, Harper, Osher, & Kneidinger, 2000). Therefore, they are usually accurate source of information (e.g., deadlines, requirements of assignments, peers’ questions about the course etc.) and materials (lecture notes, slides, etc.). They may not want to be exploited for these reasons in their course work for collaborative tasks. Second, students’ hesitation regarding not participating in educational collaborative use of Facebook may be caused by their bad experiences with group work. In most of the group works, lazy or laisse-faire students tend to participate less while hard-working students take the primary roles and complete the majority of the tasks. The current study somehow contradicted with the finding of Kirschner and Karpinski (2010) study indicating that college students using FB had lower GPAs and studying hours for courses. Different from this study, our study found a positive impact of GPA on educational use of FB. We thought GPA as an antecedent of educational use of FB rather than a consequence. 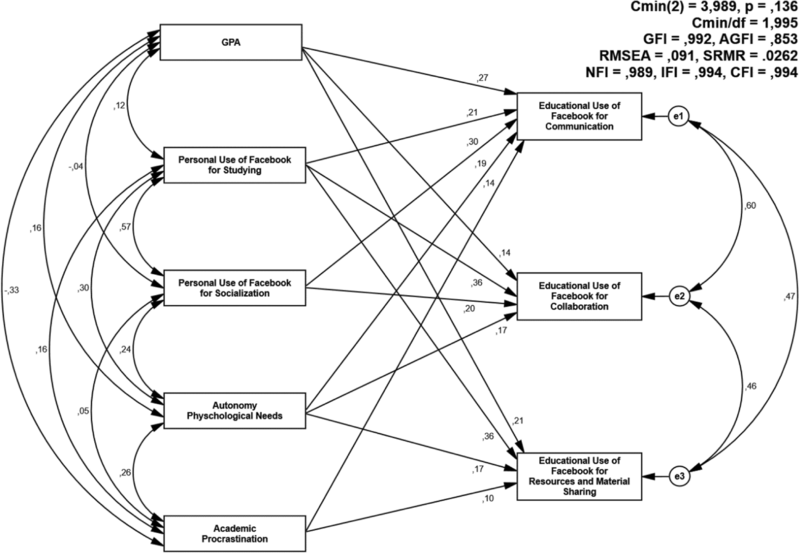 Reciprocal impacts of personal FB use, educational FB use and GPA should be examined in further studies. The second and third constructs in the study were generated from Facebook Usage Scale by Mazman (2009). Although three dimensions (social relations, for students’ studies, and daily uses) were examined in this study, only social relations and for students’ studies were associated with the educational use of Facebook. The results indicated that using Facebook for studying purposes was associated more with educational use of Facebook for collaboration and sharing compared to educational use of Facebook for communication. When students use Facebook for daily activities (to be informed about developments in daily life and to follow updated news), they are not prone to use it for educational purposes. When students use Facebook for socialization, it triggers educational use of Facebook for communication and collaboration. However, Junco (2012a, 2012b) indicated that communication and collaboration use purposes were negatively impacts of FB use in education. Contradicting with Junco (2012a, 2012b), we support the notion that types of activities that students are assigned to do on FB specifically for course tasks may create a difference in students’ time committed for instructional purposes. This requires an effective course design including associated tasks with FB. Regardless of their levels, the instructors should be trained about how to integrate Facebook into their course activities. Psychological Needs are thought to be another critical component for diverse uses of SNSs, such as FB. Association of four different psychological needs (Achievement, affiliation, autonomy, and dominance) with educational use of Facebook have been investigated in the study. The findings indicated that among these needs merely Autonomy impacted all components of educational use of Facebook. Interestingly, Joinson (2008) and Grosseck et al. (2011) stated that individual responsibility and autonomy may be increased via FB, and Hew (2011) indicated that FB can assist students to create their own learning path. When Facebook is regarded as a part of online and distance education requiring self-regulated learners, autonomy demonstrates a good fit with educational use of Facebook. 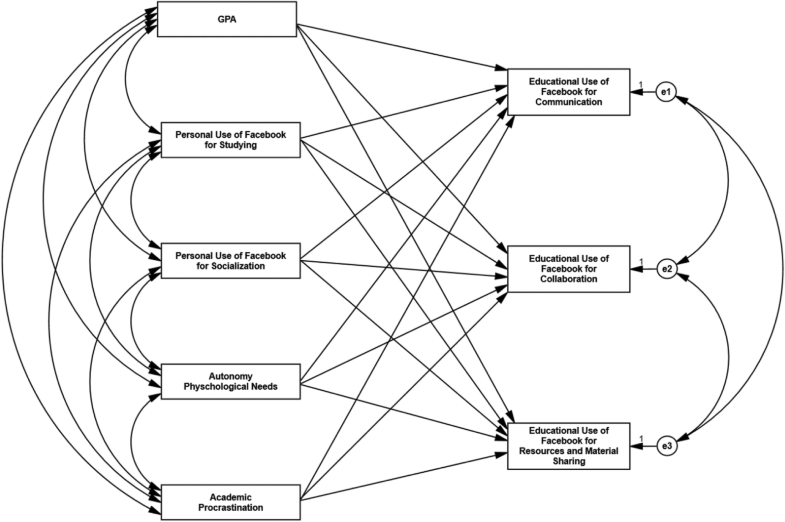 Autonomy seems to be a triggering factor for educational use of FB but not as influential as GPA and personal FB use for socialization and studying. It could be interpreted that autonomy need may be a necessary but alone not sufficient condition for Educational Use of Facebook. The current study indicated that lower academic procrastination may support educational use of Facebook. Hence, procrastination is common and harmful form of self-regulatory failures (Steel, 2007). The results embraced that it has an impact on educational applications of Facebook in terms of communication and rich material sharing but not collaboration. Şahin (2014) found that using Facebook for social relationships causes more academic procrastination than using Facebook for daily purposes. However, he also indicated that when people use Facebook for academic purposes, they are not prone for academic procrastination Şahin (2014). Slightly different from this study, the current study highlighted the effect of low academic procrastination on educational use of FB. The results indicated that students with low academic procrastination habits may be highly motivated to use FB in their courses and academic activities. There has been no association between Academic procrastination and collaborative educational use of FB. This may be caused by the fact that students doing collaboratively peer work do not tend to do any academic procrastination due to the peer pressure and peer observation for task their completion (Gafni & Geri, 2010). There is a controversy regarding using Facebook as an educational tool or not. The studies of Drouin (2011), McCarthy (2010), Roblyer et al. (2010), and Sturgeon and Walker (2009) suggested the positive results; in contrast, Junco (2012a, 2012b), Herrmann et al. (2000) and Kabilan et al. (2010) concerned about the negative influences of FB. The current study did not aim to support neither negative nor positive sides of these perspectives, but it aimed to reveal associations among some variables and various types of educational Facebook use from a functional perspective. The present study may illuminate what factors may trigger students’ intention to use Facebook for educational purposes. After conducting similar numerous studies and developing a clear framework of this, other studies may particularly examine the pros and cons of educational use of Facebook in terms of students’ performances and learning outcomes as suggested by Kabilan et al. (2010) and Bloch (2008). Since there are diverse fostering and restraining factors to use FB in education (Çoklar, 2012), scholars should identify both of them. Then, they need to enhance fostering factors and minimize the restraining factors before using FB in education thoroughly. Madge et al. (2009) indicated that FB is used for more informal learning purposes and not perceived as formal learning and teaching medium. Our study, however, provides an opportunity to make a transition from informal to formal education by suggesting certain factors affecting students’ motivations to use FB in education. Students should be well-trained about the usage of ICT for learning, the purpose of SNSs use, and the evaluation of the amount of information that they may grasp via SNSs Kirschner and Karpinski (2010), and about the guidelines to utilize FB for education (Wang et al., 2012). In addition to those efforts, we propose that the characteristics of students, which are critical inputs to educational settings, must be considered when there is SNSs use. The present study indicated that a student with a high GPA and autonomy need, using Facebook for studying and socialization, and less procrastinating academic works may be highly motivated to use FB for educational purposes. Future studies may not only focus on the constructs of the current study but also some other additional impactful variables. One of the limitations of this study was sampling strategies especially for generalizability. Convenience sampling strategies is not representative of the population since they are not one of the random sampling techniques. Using an online survey technique for data collection is another limitation. Online surveys are usually affected from sampling issues (Wright, 2005). Characteristics of participants and non-response rate cannot be clearly identified via online surveys. There may be a spectrum of people from who are willing to complete the survey to who neglected it. There is no possibility to differentiate the respondent and non-respondent participants because the majority of critical information about non-respondents remain unidentified (Guerra, 2003). These limitations may make the sample in the study inherently biased. These aforementioned issues could be overcome in future studies in which random sampling techniques are utilized. The current study initiated a valuable model which could be replicated in studies with different samples. Both authors equally contributed to this work. Both authors read and approved the final manuscript. Haverback, H. R. (2009). Facebook: Uncharted territory in a reading education classroom. Reading Today, 27(2). http://www.citeulike.org/group/12151/article/6130838. Joinson, A. N. (2008). Looking at, looking up or keeping up with people? : motives and use of facebook. Paper presented at the SIGCHI conference on Human Factors in Computing Systems, Florence, Italy, 5-10 April, (pp. 1027–1036). http://onemvweb.com/sources/sources/looking_at_motives_facebook.pdf. Kleiner, B., Thomas, N., and Lewis, L. (2007). Educational Technology in Teacher Education Programs for Initial Licensure (NCES 2008–040). National Center for Education Statistics, Institute of Education Sciences, U.S. Department of Education. Washington, DC. https://files.eric.ed.gov/fulltext/ED499205.pdf. Moghavvemi, S., & Salarzadeh Janatabadi, H. (2017). Incremental impact of time on students “use of E-learning via Facebook”. British Journal of Educational Technology. https://doi.org/10.1111/bjet.12545. Wang, S., & Kim, D. (2014). Incorporating Facebook in an intermediate-level Chinese language course: A case study. IALLT Journal of Language Learning Technologies, 44(1), 38–78. https://journal.iallt.org/IALLT/article/view/8534. Wright, K. B. (2005). Researching internet-based populations: advantages and disadvantages of online survey research, online questionnaire authoring software packages, and web survey services. Journal of Computer-Mediated Communication, 10(3), 00–00. https://doi.org/10.1111/j.1083-6101.2005.tb00259.x. Young, J. R. (2009). How Not to Lose Face on Facebook, for Professors. Chronicle of Higher Education, 55(22). https://eric.ed.gov/?id=EJ831864.